Alain Kirili is a abstract sculptor of verticality and modeling. 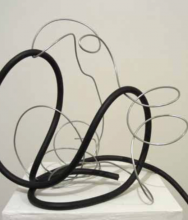 His work emphasizes an “aesthetics of spontaneity” and seeks its formal unity through the variety of materials he employs in a quest for “organic simplicity.” The improvisatory energy that is palpable in Kirili's sculpture and drawing is in part inspired by his deep relationship with improvised music. He has worked on the monumental aspects of sculpture in public spaces (at the campus of the University of Bourgogne in Dijon, in Paris and Grenoble). Alain Kirili was commissioned by the Ministère de la Culture to install the sculpture of the 20th century in the Tuileries in Paris. Most recent exhibition include Sculptures by Alain Kirili in Rodin: The Centennial Exhibition, at the Grand Palais in Paris on view March 22 - July 31, 2017. 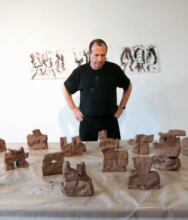 Alain Kirili works are in the following selected public collections: Blanton Museum of Art (Austin, TX), The Nasher (Dallas, TX), The Fields - Sculpture Park at Omi Int. 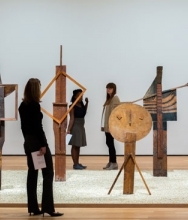 Arts Center (Ghent NY), The Museum of Modern Art (New York, NY), The Jewish Museum (New York, NY), The Brooklyn Museum (Brooklyn, NY), Dallas Museum of Art (Dallas, TX), The Morgan Library and Museum (New York, NY) ..